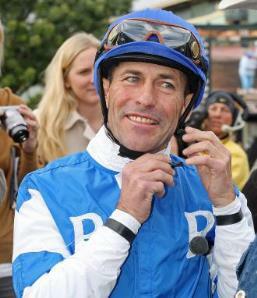 Jockey Gary Stevens has won the Kentucky Derby, the Preakness Stakes, the Belmont Stakes, and the Breeders’ Cup races mutliple times. He retired and became a TV commentator for NBC but always wanted to ride again. New surgery methods should make that possible. Stevens had his right knee replaced in an operation conducted last July 25 in a specialized clinic in Santa Monica, Calif.
His physical therapy sessions went from pain to fitness. He soon walked, tested his golf swing, and climbed stairs just for the fun of it. He hoped to be back riding in time for the Breeders’ Cup Championships at Santa Anita Park. The Equicizer is a mechanical horse of sorts invented by former jockey Frank Lovato Jr. that lets a rider simulate the posture and physical intensity of finishing a race on the back of a Thoroughbred. Injured jockeys use it for rehab. Active jockeys use it for fitness and warm-ups. But first Gary needed an OK from his doctor. After talking to his doctor, it was decided to hold off on his comeback for 2 more months. That would make it after the Breeders’ Cup. Part of the process of a knee replacement, at least in Stevens’s case, requires complete healing of the attached femur which usually takes about 12 weeks to heal. What a coincidence – Santa Anita Park opening day!